Protective glazing is specified to mitigate the effects air pollution, conserve energy and protect your stained or leaded glass windows from vandalism. 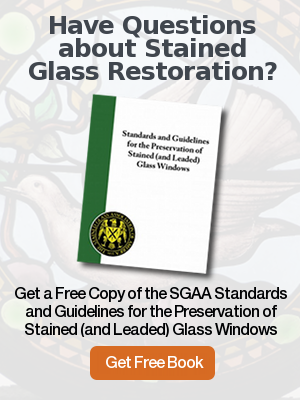 When determining if protective glazing is necessary and which type of glazing is best for your particular windows, multiple factors must be considered; most importantly, the age, structure and condition of the stained and leaded glass windows as well as the materials and methods used in their fabrication. 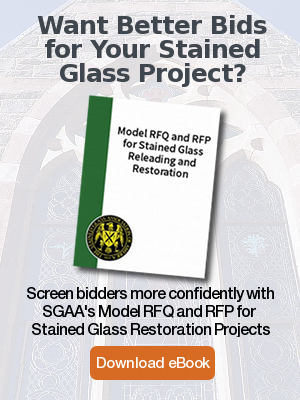 Another factor is to determine if the existing frames can properly accommodate a protective glazing system and if any existing plastic is covering the stained glass which would possibly cause oxidation and wood rot. Although exterior protection is not always necessary for the longevity of the Stained glass, it should be properly designed when installed behind or incorporated within the stained glass when used. Rohlf’s Studio adheres to the principal of conforming to all the existing shapes, either in wood or stone, when installing protective glazing. An air space of a minimum of 1/4″ to 3/4″ should be procured when installing the protective glazing without a new framing system, and also be properly vented. Framing systems are available to accommodate both stained glass, 1″ insulated glass & 1/4″ glass along with venting through the framing. we at RobIf’s Studio adhere to the principles of using clear float, safety, tempered or hurricane glass as required by code, along with a properly designed venting system. Rohlf’s Studio would be pleased to survey your existing conditions, make recommendations and submit a proposal for your consideration.